The Austrian government, known for its active participation in the advancement of human rights, has on several occasions provided support for Kurds who suffered systematic persecution by the Iraqi Baath regime. As a response to the 1975 refugee crisis and under the initiative of the former Austrian President Dr. Heinz Fischer, then a member of the Austrian parliament, the Austrian government agreed to grant asylum to 100 Kurds living in Iranian refugee camps in 1976. During the first free general elections in 1992, Austria supported the Kurdistan Region of Iraq by sending a high-ranking delegation to observe the elections. These elections were deemed to be fair, free and democratic by the Austrian and international observers and resulted in the creation of the Kurdistan Regional Government-Iraq and the first Kurdistan National Assembly. Since the collapse of Saddam Hussein’s regime in 2003, the Kurdistan Region managed not only to establish a stable autonomy, providing health care, education and infrastructure, but also secured a number of foreign investments, further contributing to the Region’s fast economic development. In 2006, an Austrian Commercial Office was established in Erbil and Austrian Airlines started business as one of the first investors in the Region. Being the first international carrier to offer regular direct flights between Vienna and Erbil, Austrian Airlines contributed to connecting the international community with the Kurdistan Region. Since 2007, Austria’s OMV is exploring the rich oil and gas resources of the Kurdistan Region. Business relations were further expanded in 2012, when the renowned Austrian company Doppelmayr completed two cable car projects on Korek and Chavy mountains, and has begun a third project in Duhok. To contribute to the intensification of Kurdish-Austrian relations, Austria’s Foreign Minister Dr. Michael Spindelegger visited Erbil with a large business delegation in November 2011. The focus of meetings with President Masoud Barzani, Prime Minister Barham Salih and Minister for Foreign Relations Falah Mustafa was on further strengthening economic ties between the two areas. Kurdish representatives have visited Austria regularly in the last years and reciprocal business forums were held on several occasions. 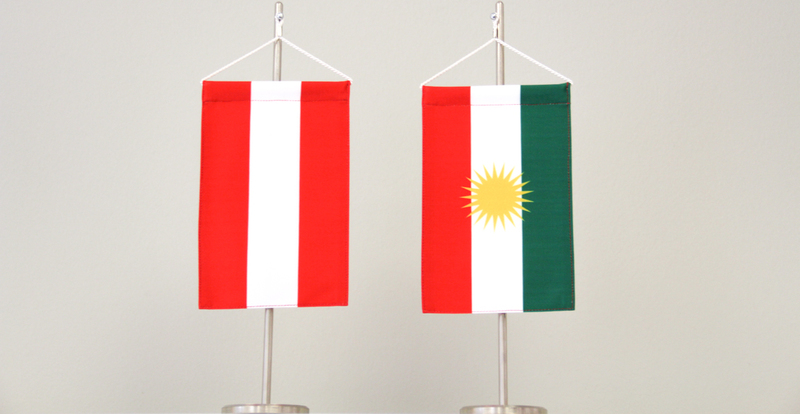 With the opening of the 13th KRG representation office world-wide on 14 June 2012 in Vienna, a new milestone in the relationship between the Kurdistan Region and Austria was reached. The aim of the representation is to encourage greater coordination between the respective communities and governments of the Kurdistan Region and Austria in the areas of economy, culture and academia. The Austrian government plans to open an Honorary Consulate in Erbil in the near future to further strengthen its relationship with the Kurdistan Region. Austria once more proved to be a reliable partner of the Kurds during the current crisis in Iraq. On the one hand, Austria provided millions of Euros in humanitarian assistance to the Kurdistan Region in order to meet the basic needs of the countless refugees and IDPs, who have fled to the Region. On the other hand, a number of high-level delegation visits between Austria and Kurdistan took place, in which Austria also expressed her political support to the KRG. Austrian Foreign Minister Sebastian Kurz for instance visited Kurdistan in February 2015, in order to meet numerous officials. Moreover, the President of the Kurdistan Region travelled to Austria in the same month, meeting Austrian President Heinz Fischer. Additionally, numerous parliamentary delegation visits, just as visits by Minister Falah Mustafa, Head of the KRG Department of Foreign Affairs, to Austria have taken place.